On a surprisingly sunny Thursday afternoon in Sarajevo, I fired up my laptop for my weekly flight treasure hunt. I had three days up my sleeve and access to an airport – Europe was my oyster. 24 hours later, I landed in Budapest. Often described as “The Paris of Eastern Europe”, I was expecting art nouveau and a cultural smorgasbord. What I didn’t expect was truly a tale of two cities – historic Buda to the East, and modern Pest to the West, split right down the middle by the mighty Danube. While still honouring it’s gothic roots, Budapest is also home to an underground millennial culture with a thriving art and nightlife scene, and thus rooting itself firmly on the backpacker trail. Make no mistake, Budapest is BIG. With two million residents and close to three million visitors per annum, it’s actually quite spread out. Although it is the beating heart of Hungary, people aren’t living on top of each other as the city is spread out across 23 districts. Best part? While it looks fancy, it’s cheap. Navigating the trams and usually with a snack in each hand, here’s what I got up to in three magical days. Open every day except Sundays, the Central Market Hall can be referred to as nothing less than an institution. Built in 1897, here you will find souvenirs, smoked meats, fresh fruit and vegetables, eateries and the best dose of people watching I’d had in quite some time. I was more than content to park up on the third floor with my bowl of goulash, and observe the ruthless housewives barter for the best wad of salami. Hint: contrary to belief, early morning is not the quietest time to visit. Local restaurants the first in the door to stock up for the day. Literary nerds, unite. Imagine the palace from “Beauty And The Beast” 0 are you weak at the knees yet? This is where we belong. Built in the late 1800’s as what was once known as the Wenckheim Palace, this stunning example of Hungarian Neo-Baroque architecture was purchased by the local council in 1931 and restored to what you see now. Visitor tickets are available for purchase, enabling poor (and slightly hungover) souls much like myself to hide away in one of the many reading rooms. The concept is essentially to open a bar in an old “ruined” building. I was baffled, but since it’s considered THE thing to do in Budapest, it had to be done. Upon arrival, I quickly realised that it was actually quite similar to what we would refer to as a “beer garden” at home in Australia. Who doesn’t like to get drunk outside? I had some friends from home also in town, so we set out to the most famous of them – Szimpla Kert. Packed full of flea market furniture, cheap beer and a bunch of bohemians, frankly I can’t remember a great deal of it. I do recall an equal mix of foreign travellers and local Hungarians mingling amicably. Szimpla Kert also gets a special shout out for housing another hidden gem – a weekend farmers market and cafe. If you can’t find a recovery remedy here, well – you’re on your own. If you’re doing it for the ‘gram, you have to hike up some hills. Located on the east side of town in the hills of Buda, you will easily the best viewpoints of the city, Parliament House and the Danube River. This also provides an access point to Buda Castle if that’s what floats your boat. Although it is now a replica of the original fort used in 19th century as a watchtower, it doesn’t take away from the gothic Disney vibe one bit. I realised very quickly that Hungarians love a good tub, especially the type that sit at an average of 75 degrees celsius. 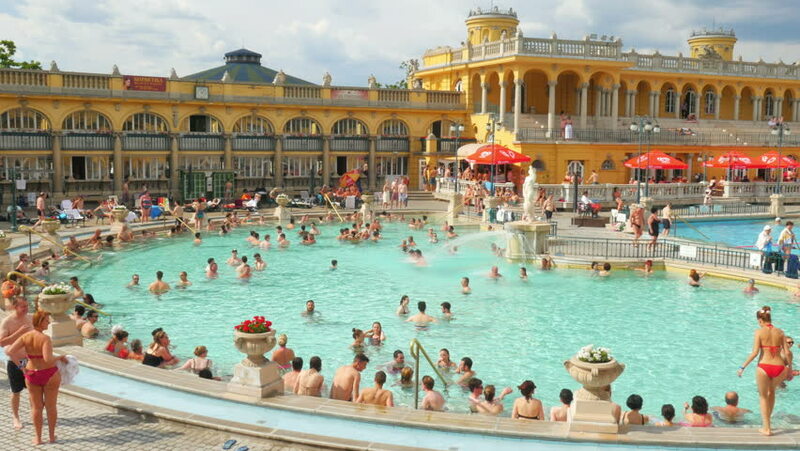 Spoilt for choice, I opted for the thermal bath closest to my hotel with decent reviews – Széchenyi Thermal Bath. Towel and swimmers in tow, off I went up to the city park feeling mostly optimistic. Turns out, these thermal baths have been popular for centuries for generally medicinal purposes – containing anything and everything from sulphate, calcium, magnesium, bicarbonate and a significant amount of metaboric acid and fluoride. That, and I guess it’s usually pretty cold outside. In another blend of old meets new, Budapest is filled with stand alone bronze sculptures, murals and museums. The easiest way to find them all? Put one foot in front of the other. One sculpture in particular stood out to me – “Shoes On The Danube”. Created by sculptor Gyula Pauer, these serve as a memorial to the 400, 000 Jews killed in Hungary during World War II. Eat Langos – it’s something between cheesy garlic bread and pizza. Thank me later. Vaci Street – Budapest’s answer to Oxford Street, for all of your shopping requirements. Vajdahunyad Castle – nestled in City Park, Bram Stoker allegedly pictured this as the castle Dracula called home.